"we suppose happiness is enduring and definitely not prone to fluctuate, but the same person’s fortunes often turn to and fro. For clearly, if we take our cue from his fortunes, we shall often call him happy and then miserable again, thereby representing the happy person as a kind of chameleon, insecurely based. But surely it is quite wrong to take our cue from someone’s fortunes. For his doing well or badly does not rest on them. A human life, as we said, needs these added, but activities in accord with virtue control happiness, and the contrary activities control its contrary." - Aristotle, Nichomachean Ethics 1100bff. "What, then, prevents us from calling happy the person who is active in accord with complete virtue and is adequately supplied with external goods not for some random period of time but in a complete life? Or must we add that he will continue living like that and will die accordingly, since the future is obscure to us and we suppose happiness to be an end and complete in every way? If so, we shall call “blessed” those living people who have and will continue to have the things we mentioned—blessed, though, in the way human beings are." So - ﻿on one hand Aristotle thinks that "good fortunes" are somehow necessary for something related to happiness - a human life needs them added. On the other he thinks virtue is enough to control happiness. It's tempting to assume that Aristotle thinks that a fortunate virtous person would be more happy than an unfortunate virtous person - which would be a most unfortunate move by Aristotle as he himself has made it so clear earlier in the Nicomachean Ethics that it's not possible to be more or less happy. 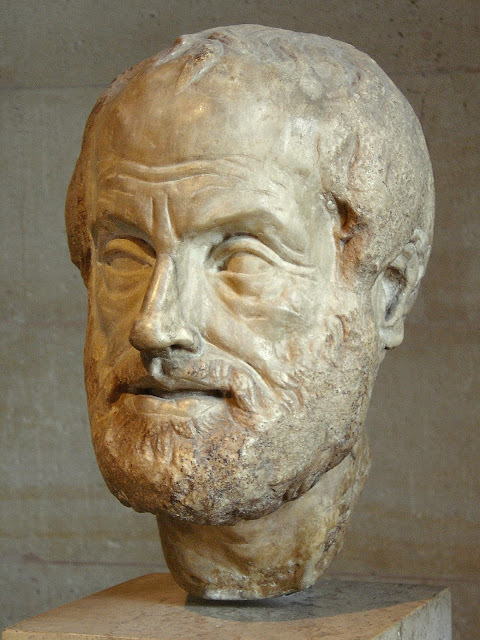 "Happiness" is a state where nothing can be added - but what Aristotle seems to think characterizes the virtuous, blessed person is not that he is more happy than the virtuous, non-blessed person - but simply that he is able to act virtuously to a fuller extent (because he is in a better position). But how exactly does this make this kind of person "blessed"? Presumably, Aristotle would answer that a person who has a reasonable amount of money, good looks, friends, family, good health and good reputation is in a better position to do good in the world than one who is less endowed by fortune - and, thus, more fully a human being and, thus, more blessed. Somehow this seems sort of not wrong and this intuition is clearly an important point of departure for Aristotle. However, it also seems evident that an unfortunate, virtous person cannot reasonably be described as less virtous (and thus less happy) than a fortunate, virtous person - and that intuition is preserved as well in this interpretation of Aristoteles' thoughts on the importance of external goods. On this interpretation, then, exernal goods are a necessary requirement not for essential virtous activity (and thus not for happiness) but for blessedness understood as extended virtous activity. A wise person is still wise (and thus happy) if he or she is poor, in jail, under torture and all alone. He or she is an essentially realized human being. But a wise person who is free, not in pain, not poor and not alone is a more fully realized human being. Not happier - but more blessed. Portrait of Aristoteles. Copy of the Imperial era (1st or 2nd century) of a lost bronze sculpture made by Lysippos. Is it possible that Aristotle believed that good and bad fortune are part of life and that they provide, define, or act as contrast to what life is in essence but that a virtuous person would select to be happy regardless of current fortune? He says in the quote above that a human life needs "fortunes" (good fortune) added. I don't think it's possible to interpret that in any other way than good fortune is necessary for happiness. Part for the definition Aristotle gives of happiness in Book I of the Nicomachean Ethics is that it is complete (autarkes). Nothing further can be added to happiness. If anything needs to be added to make life complete we have not yet reached happiness. It seems to me that Aristotle is trying to say that good fortune is preferable but not necessary for happiness - and that it is preferable because it enables us to do good to a greater number of people. In other words he seems so close to agree with the Stoics that it is hard to avoid the impression that he would indeed have agreed with them if he had known (or himself thought of) the distinction between true goods and preferable indifferents. Notice that "fortunes" are not good in themselves in the quote above - only as means to act virtously on a grander scale. In other words they are not true goods. "All the same, it apparently needs external goods to be added, as we said, since it is impossible or not easy to do noble actions without supplies. For just as we perform many actions by means of instruments, we perform many by means of friends, wealth, and political power. Then again there are some whose deprivation disfigures blessedness, such as good breeding, good children, and noble looks. For we scarcely have the stamp of happiness if we are extremely ugly in appearance, ill-bred, living a solitary life, or childless, and have it even less, presumably, if our children or friends are totally bad or were good but have died. Just as we said, then, happiness does seem to need this sort of prosperity to be added". Again, it is clear that the external goods are not good in themselves but as means for virtous action. Regarding blessedness it is interestingly described as "the stamp of happiness". Again the idea seems to be that a person with reasonably good looks, good reputation, a reasonable amount of wealth and with friends, family and influence - and who take full advantage of his good fortune to do as much good as possible - are more fully a realization of what a human being naturally is than a virtous but isolated, poor, disfigured and dishonored person is. Not more happy - simply more fully a realization of what a human being naturally is. The Stoics would surely agree. They also see the things such as health, wealth, friends, family, influence as things a wise human being would naturally prefer to have. "There is a great difference between joy and pain. If I am asked to choose, I will pursue one and avoid the other; for the one is in accordance with nature, the other contrary to it." "Being wounded, or being roasted over a slow fire, or being afflicted with ill health is contrary to nature, but preserving an unflagging spirit amid such trials is in accordance with nature." Bottom line: In my opinion, Aristotle has been wildly misunderstood regarding this topic. First of all "external goods" such as some amount of health, wealth, goods looks, good reputation, and friends and family are only goods in so far as they are used wisely and in the service of virtue. In other words, they are only instrumental goods. Secondly they are only necessary for blessedness - not for happiness. A virtous person will be entirely happy without them but not "blessed" - not a fully realized human being but an essentially realized human being. In other words, what a Stoic can learn from Aristotle is that while external goods are neither good nor bad in themselves, they are not irrelevant for an understanding of what a fully realized human being is.